News Forum: The debates still come up. Should logging be allowed in the BWCA? Mining? More motors? Or should the area be sacrosanct? News Forum: What are your memories of the BWCA? What did visits to this wild space mean to you? It was 25 years ago Tuesday that President Jimmy Carter signed a bill creating the Boundary Waters Canoe Area Wilderness. 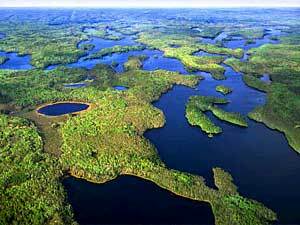 Minnesota's one million-acre canoe country first joined the National Wilderness system in 1964. But the region was given special exemptions to allow motors, logging and even mining. The controversy over what was appropriate in the wilderness boiled for years. Then, in 1978, two lawyers drafted an historic compromise that still guides activities in the Boundary Waters today. Ely, Minn. — This time of year, Sawbill Lake's mirror surface reflects an impenetrable wall of pine green, maple red and aspen gold. The air carries a a cool, Christmasy blend of balsam and sweet fresh water. And sometimes when the wind drops, there's almost no sound at all. Canoe outfitter Bill Hansen has lived much of his life on the banks of Sawbill Lake, a southern access to the one million-acre Boundary Waters Canoe Area Wilderness. "I can't believe it's been 25 years already," he says. Hansen's father bought Sawbill Outfitters in the early 1970s. That's when you were more likely to hear the whine of a motorboat than the call of a loon. All that changed Oct. 21, 1978. The Boundary Waters Canoe Area Wilderness act banned motors here, and on dozens of other "motorized" lakes in Minnesota's federal wilderness. "In '78 I wasn't all that pleased that the motors were taken off of Sawbill Lake," Hansen says. "I was heavily involved in motor use and had a pretty significant financial stake in it. But, looking back now, I can see the deeper wisdom in it." Disputes over Minnesota's canoe country go back almost a century. Logging and roads have been debated since the 1920s. Float planes were restricted in the 1940s. In the early 1960s, Minnesota U.S. Sen. Hubert Humphrey was determined to include Minnesota's canoe country in the nation's new federal wilderness system. But some northeast Minnesotans opposed restrictions that come with wilderness designation, so Humphrey created special language for the Boundary Waters. It allowed motorboats, snowmobiles and some logging. When the Wilderness Act was passed in 1964, The Boundary Waters was the nation's only wilderness area with such exceptions. A decade later, Kevin Proescholdt was working with the pro-wilderness Friends of the Boundary Waters Canoe Area. Proescholdt was building grass roots support to stop logging, mining, and motors -- all, he says, incompatible with wilderness stewardship. "And this set up a problem, where the Boundary Waters was a wilderness in name, and was included in the new national wilderness system -- which was very important, but was not a wilderness in management," says Proescholdt. One by one, mining, logging, snowmobiling and motorboating were each challenged, in federal lawsuits and formal appeals to Forest Service plans. To many, it had become clear the issues surrounding access to the Boundary Waters could only be settled in Congress. Eighth District Rep. Jim Oberstar, a DFLer from northeast Minnesota, fired the first shot in October 1975. His bill proposed two zones within the BWCA -- one with full wilderness protection, the other where logging, boats and other motor recreation were to be permitted. Oberstar explained his position in a 1977 news conference. "My view is that we ought to have protection, but more intensified, more broad-based recreational use of the BWCA, plus some very limited commercial timber harvesting in the second growth areas of the BWCA," Oberstar said at the time. Conservationists enlisted the help of another DFLer from Minnesota, Congressman Don Fraser of Minneapolis. Fraser drafted a bill that was in direct conflict with Oberstar's. Speaking at the same news conference, Fraser explained the provisions of his bill. "My bill principally restores the BWCA to the true wilderness status. In addition, we add about 35,000 acres at particular points around the periphery of the BWCA -- simply to provide a better boundary where we take in the other sides of lakes where lakes are divided, and so on," Fraser said. Resolving the dispute between the two positions fell to a U.S. House subcommittee on national parks and recreation. It held two field hearings in Minnesota in July, 1977. The first, in St. Paul, packed a State Capitol hearing room to overflow. Predictably, the St. Paul hearing was stacked with wilderness supporters, like State Rep. Willard Munger, DFL-Duluth. "We must recognize the need for more wilderness and land allocation as a means of maintaining and restoring complete, natural ecosystems. Full wilderness status for the Boundary Waters Canoe Area, as proposed by Congressman Fraser, is long overdue," said Munger. The next day's hearing, held in Ely on the edge of the BWCA, was very different. Logging trucks lined the street. Effigies of environmentalist Sigurd Olson and Friends of the Boundary Waters founder Bud Heinselman swung from one truck's boom. Inside, speakers were shouted down. Kevin Proescholdt remembers well when Sigurd Olson rose to speak. "His views were not universally shared by everybody in Ely. His testimony, despite the tumultuous boos and jeering at the field hearing, was quite eloquent and beautiful about the need to protect the Boundary Waters," recalls Proescholdt. After the hearings, congressional staff drafted another bill, which was co-sponsored by Minnesota Congressman Bruce Vento and California's Phil Burton. But it stalled too, until grueling negotiations between environmental attorney Chuck Dayton and Ely City Attorney Ron Walls produced a compromise proposal. The final measure was known as the Dayton-Walls agreement. Under Dayton-Walls, some lakes would remain motorized, but many converted to canoe wilderness. Logging would be prohibited. With two small exceptions, snowmobiling would be banned. And the size of the Boundary Waters would expand. The Dayton-Walls agreement passed Congress just hours before the session closed. President Carter signed the bill into law on Oct. 21, 1978. The years since haven't been without dispute. In the mid- 1990s, another round of mediation was needed to reach a compromise on whether trucks could be used to carry boats across two portages between motorized lakes. In 1998, those trucks were allowed to resume. "When the two portages were reopened, a lot of the hostilities disappeared," says Mike Forsman, a St. Louis County commissioner and one-time mayor of Ely. "That gesture has helped a lot," says Forsman. "It's given a lot of our senior citizens the ability to continue going into Basswood (Lake), where they've fished all of their lives, and to bring their grandkids in there to fish, where they wouldn't be able to do it without those portages being opened." But few believe the disputes have been laid to eternal rest. Forsman worries about new proposals being pursued, to close roads and create additional wilderness on the outer borders of the BWCA. "There's always a movement to take and make it more restricted -- less logging, less this," says Forsman. But as time passes, there are fewer people who remember the time before the creation of the Boundary Waters Canoe Area Wilderness. Forest Service ranger Gary Robinson is checking the boat ramp at Sawbill Lake. Robinson says visitors have adopted a wilderness ethic. "When I started here 25 years ago, we'd pick up two 50-gallon garbage bags of garbage in one trip. And nowadays, we'll come back with maybe a quarter of that garbage," says Robinson. Outfitter Bill Hansen says the nation's desire for wilderness will only increase. But for complete wilderness status, the Boundary Waters may have to wait. "Full wilderness status for the Boundary Waters is a very open goal. Having that happen the next year? Probably not. You know, next decade? Probably not? In our lifetimes? Probably not. But, eventually," he says. Then, Bill Hansen picks up his paddle and heads for home.